A carelessly used credit card has put the Punjab Police on the trail of the persons who could have killed 22-year-old Vikramjit Singh, alias Vicky, son of a leading Ludhiana-based industrialist. There was a virtual stampede on the Pakistan side along the zero line on joint Indo-Pak check post at Sadiqi in Fazilka sector as a large number of people gathered to have a glimpse of MP Navjot Singh Sidhu, who had come to preside over a cultural programme organised by the Fazilka Press Club on late Tuesday evening. Sant Balbir Singh Seechewal's relentless efforts of cleaning the Kali Bein rivulet have started bearing fruit. The President, Dr APJ Abdul Kalam, has not only recognised his work but will be visiting his Nirmal Kuteya in Sultanpur Lodhi of Kapurthala district on August 17. Six women inmates lodged in Central Jail here along with their children were shifted to Ludhiana Central Jail today amid protests. The Gurdwara Sudhar Lehar Panthic Committee of various Akali factions led by Mr Manjit Singh Calcutta today submitted a memorandum to Giani Joginder Singh Vedanti, Jathedar of Akal Takht here, demanding immediate gurdwara reforms, including appointment of Sikh high priests as per the maryada. About 8 per cent difference in prices is leading to smuggling of petroleum across the Punjab-Himachal borders in the both districts. Shopkeepers in border areas of the state have found an attractive business in the difference in rates of petrol. 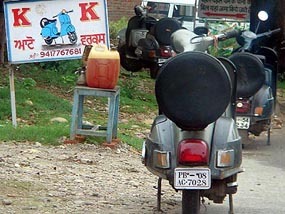 A view of illegal sale of petrol on the borders of Punjab and Himachal in the Talwara area. Ramanpreet Singh Randhawa, a youth from Patiala who was now living at Concord in California (USA), was murdered by two persons at a birthday party on August 14. The Marxist Communist Party of India (United) today released its updated programme that details the party’s vision on future economic policies. Mr Parkash Singh Badal, President, SAD, announced pre-poll promises while addressing a rally here today. 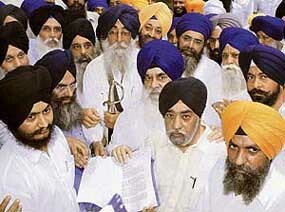 Leaders of the SAD and the BJP launched a campaign against the Punjab land Preservation Act (PLPA) 1990 here today. Mr Gurkirat Singh Kotli, political adviser of Punjab Congress chief Shamsher Singh Dullo, today made his claim for ticket for the Payal Assembly segment by saying that his grandfather, the late Beant Singh, won from that place four times. Hundreds of activists of the Communist Party India (Marxist) (CPM) Punjab and residents of the localities on the Fatehgarh Churian road and the bypass here today held a protest march against the Khanna Paper Mill for spreading pollution in the area. An official of the Veterinary Department allegedly flouted rules to avail of voluntary retirement and service benefits despite being convicted in a criminal case. Ms Rajinder Kaur Bhattal, Deputy Chief Minister and Minister of Irrigation and Power, laid the foundation stone of 66 KV grid sub-station at Ghamur Ghat, near Khanauri, 70 km from here, on Monday. Pak Rangers lathicharged surging crowds at the Sulemanki tower complex to watch the Independence Day celebrations near the Sadaki joint post, 45 km from here. A large section of activists of the Fourth Class Employees Union, Punjab, yesterday started a two-day hunger strike in front of the statue of Mahatma Gandhi here in protest against the “maltreatment” meted out to them by the state government. Mr Satish Kumar Sharma, IGP, Punjab Police, Patiala Zone, was awarded the President’s Police Medal for meritorious service on the eve of Independence Day. A youth who was presumed to have died and whose body was taken to the cremation ground on Monday, was brought back to his locality yesterday where a religious preacher tried to bring him back to life before the police made him see reason. Mr Bir Devinder Singh, Kharar MLA, has directed the local Municipal Council to provide adequate supply of water to the residents of the town by running tubewells on generator sets during power cuts. Residents of Baba Sotal today blocked the Morinda-Ropar road, demanding the arrest of those responsible for the death of a property dealer, Manjit Singh. Jails in Punjab are virtually bursting at the seams with 3,000 inmates more than the capacity of 12,000 persons. Mr Raman Kumar Verma was elected president of the Panchayati Raj Engineers Association (Class-1) while Mr Parkash Singh its general secretary. Independence Day was celebrated with enthusiasm in the district. The district-level function was organised at the grounds of MG College. Mr Harnam Dass Johar, Minister for Public Health, hoisted the National Flag. The Director, Agriculture, Punjab, Mr Balwinder Singh Sidhu, who was honoured yesterday with a State Award by the Chief Minister, Capt Amarinder Singh, at Patiala, is an expert in agricultural engineering and water usage management. The BKU (Ekta) has criticised the statement of Chief Minister Amarinder Singh made on Independence Day pertaining to the waiving of interest on cooperative loans for farmers. After a thorough inquiry into the complaint of Mr Paramjit Singh, a son of Khan Singh of Maitla, Bulhowal police station has registered a case under Sections 4/5 of the Child Marriage Act against Davinder Singh and his wife Harjinder Kaur of the same village and five of his other relatives for forcibly marrying his 15-year-old daughter Gurpinder Kaur with 30-year-old Tarsem Singh, a son of Major Singh of Naagra village (Jalandhar). The district police has unearthed a six-member gang of robbers responsible for a number of looting incidents and arrested its three members. Three deaths were reported in separate incidents during the past 24 hours here. A man, along with his son-in-law, reportedly murdered his daughter following an altercation with her over her illicit relations here today. Under the banner of the Punjab Computer Teacher Union, Sangrur, computer teachers of this district today burnt the effigy of Punjab Finance Minister Surinder Singla near main bus stand here in protest against the alleged “anti-computer teacher policies” of the state government.